Add pasta a little at a time to boiling water. 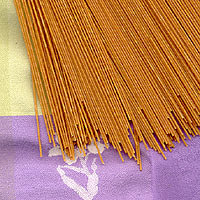 To prevent pasta from sticking to the bottom of the pan, stir gently until the water returns to a rapid boil. Cooking time varies, depending on the pasta’s shape and size. After cooking, drain and rinse with cold water to stop cooking. As a general rule, use light sauces for delicate pastas like capellini or angel hair, and chunky, richer sauces for sturdy pastas, such as fuselli and linguini.